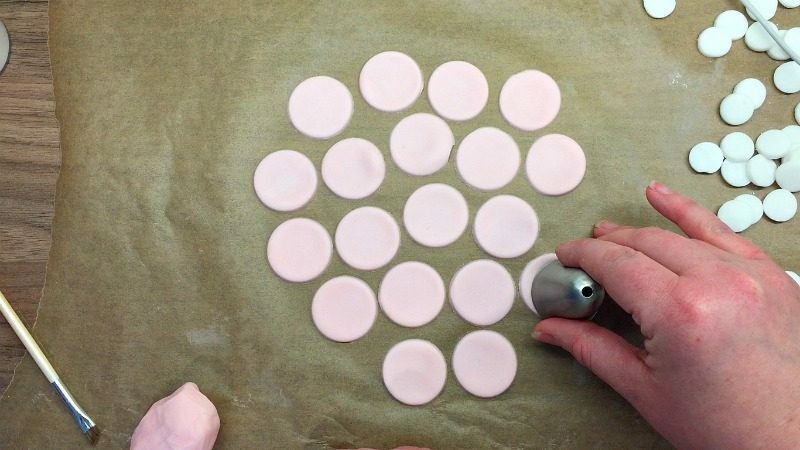 First, start with white fondant and CMC / Tylose powder. 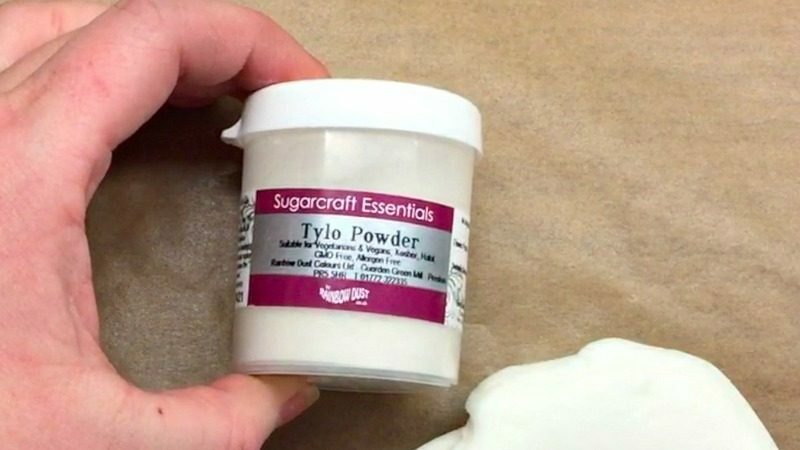 This powder makes fondant dry harder and quicker. 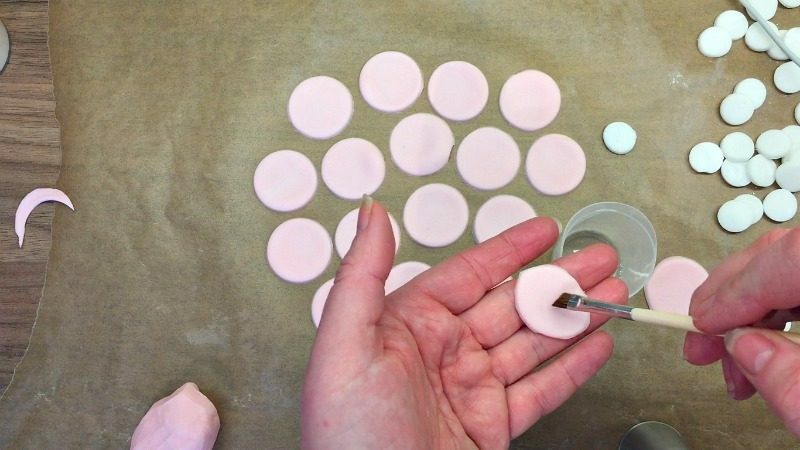 Experiment with how much to add but start with between 1 and 2 teaspoons per 500g of fondant. I added approximately 1.5tsp to 500g. 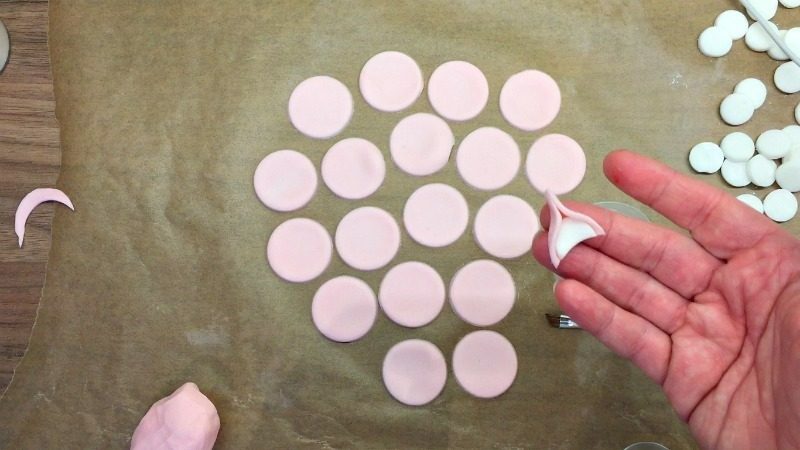 Simply put the powder onto the fondant, fold it over to encase it and then knead it in. 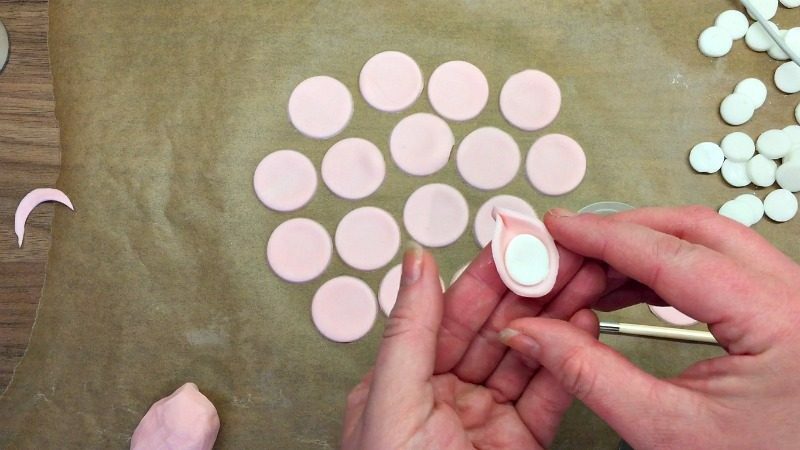 Roll the fondant out as thin as you can – a couple of mm, and then, use a small piping nozzle or circle cutter (mine was about 1.5cm in diameter) and cut out 2 circles for each cupcake. 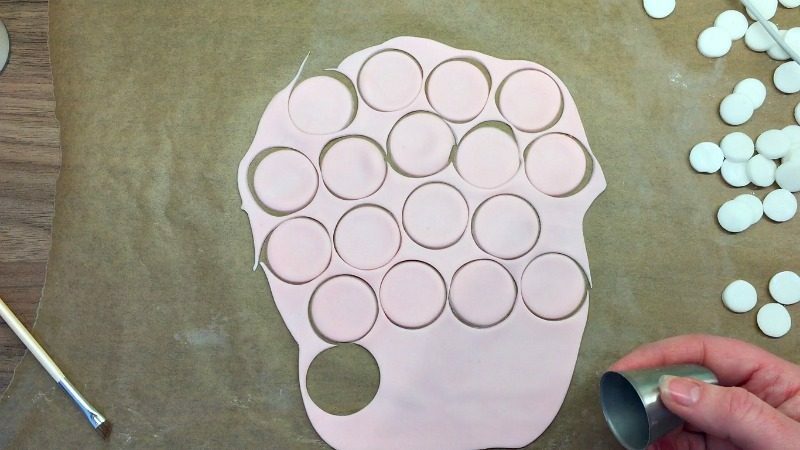 Then, dye some fondant (with cmc powder mixed in) a light pastel colour and cut out 2 larger circles per cupcake. I again used a piping nozzle, this one was about 3cm in diameter. 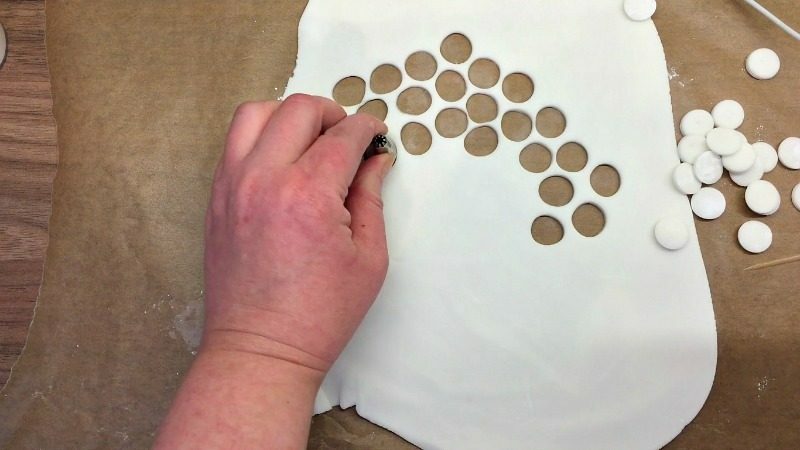 I then used the same ‘cutter’ to turn the larger circles into ovals. 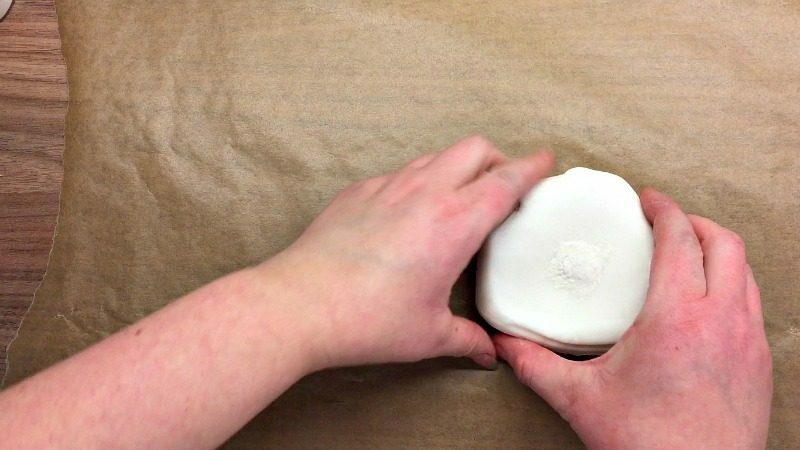 Use a clean brush, such as a clean make up brush, to stick the smaller circle onto the larger one. Pinch the top of the larger circle to make it look like an ear. Stop here! For some reason, I decided to trim the ears to half their length. 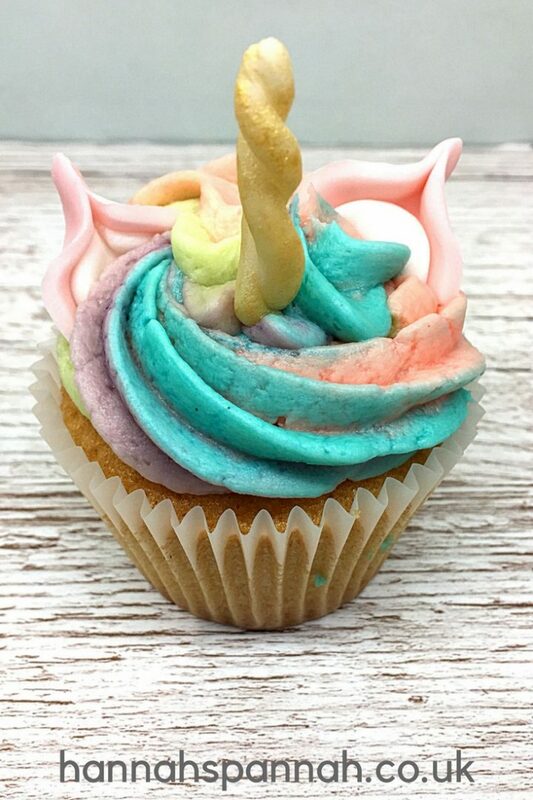 This would be great if I were sticking them onto a fondant topped cupcake but for the buttercream frosting that I chose, having the ears at their full length would have probably been better to stick them in. Anyway, you live and learn. 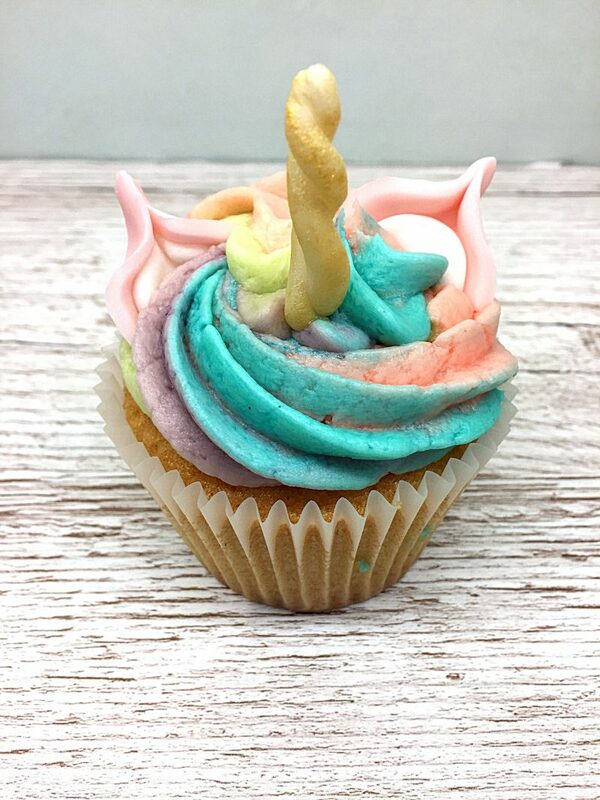 Now it’s time for the unicorn horns. I found this really tricky! 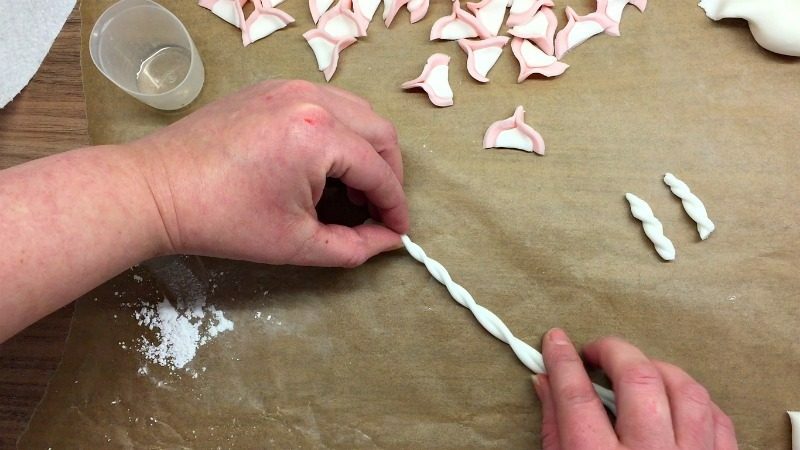 Roll two lengths of fondant, wet one with a little bit of water and then twist and roll them together. 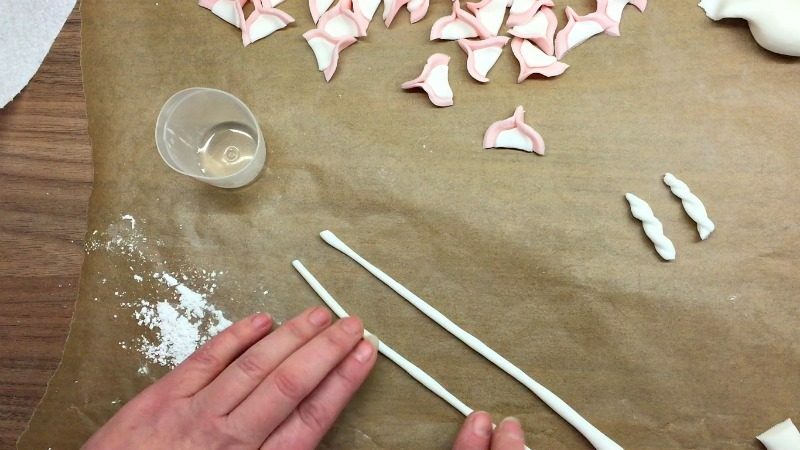 Form a point and cut each horn to be 2cm / 2.5cm long. 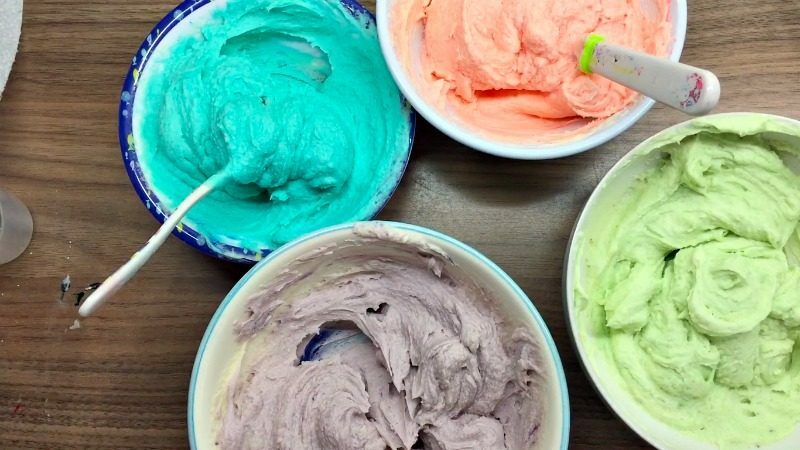 Separate your buttercream into 4 bowls and colour them your favourite unicorn colours. 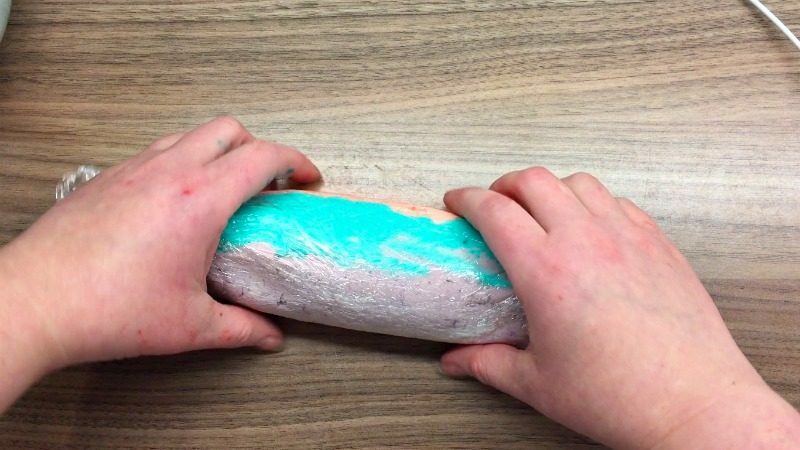 Next, roll out a piece of cling film and spread a ‘log’ of each colour buttercream next to each other. 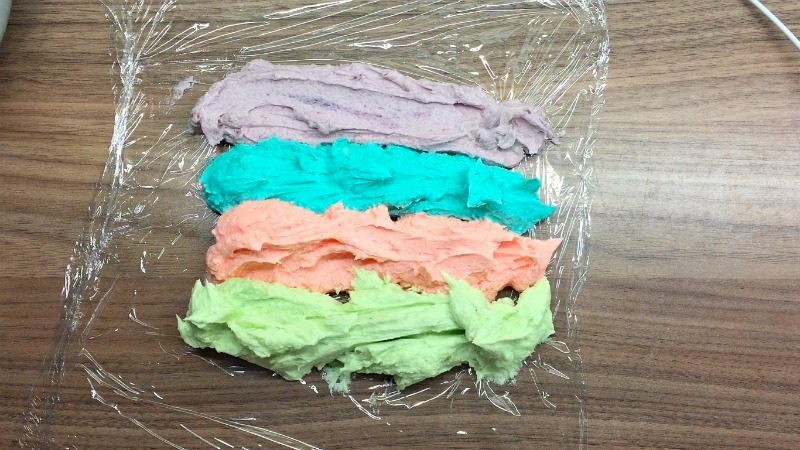 Fold two colours of buttercream on top of the other two and press the cling film together. 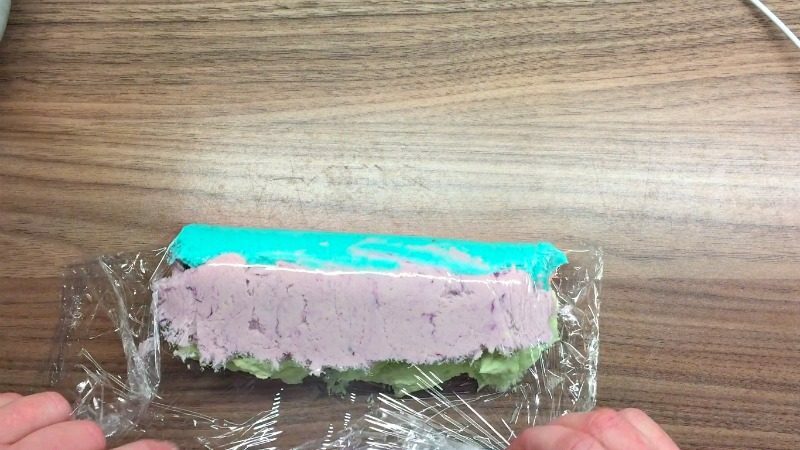 Gently seal and roll the buttercream into a ‘sausage’ shape. 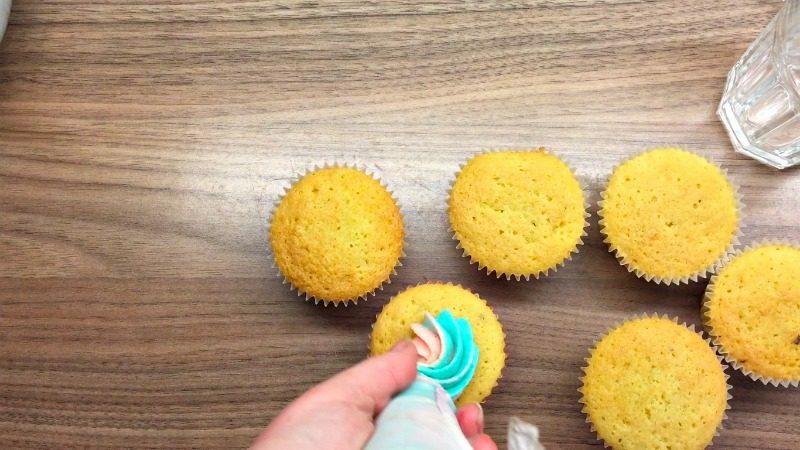 Take a glass, place your piping bag with the nozzle already attached, into it and then put the buttercream sausage into it. 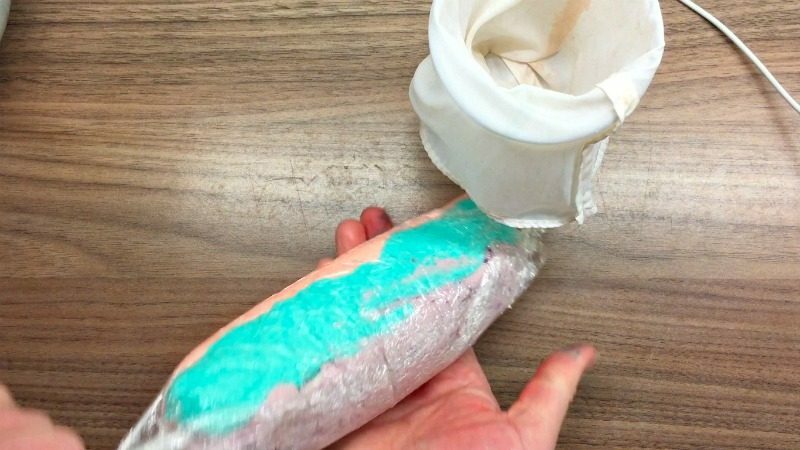 If you have a lot of cling film at the end facing down, cut it so that the buttercream can come out easily. 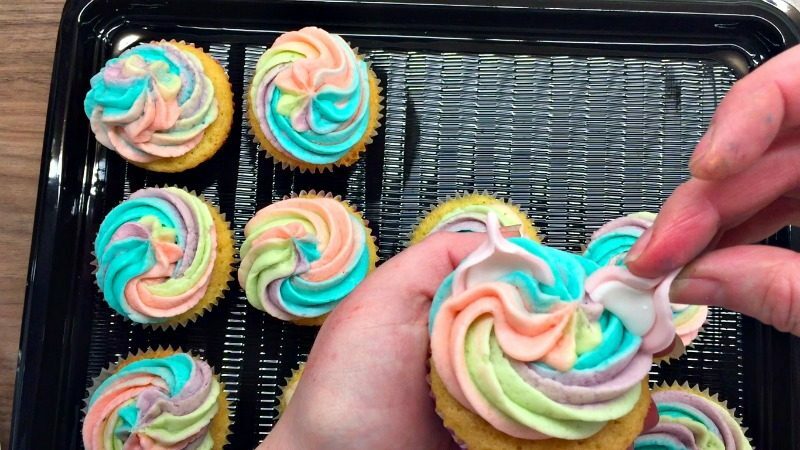 Then it’s time to pipe the rainbow onto your cupcakes. 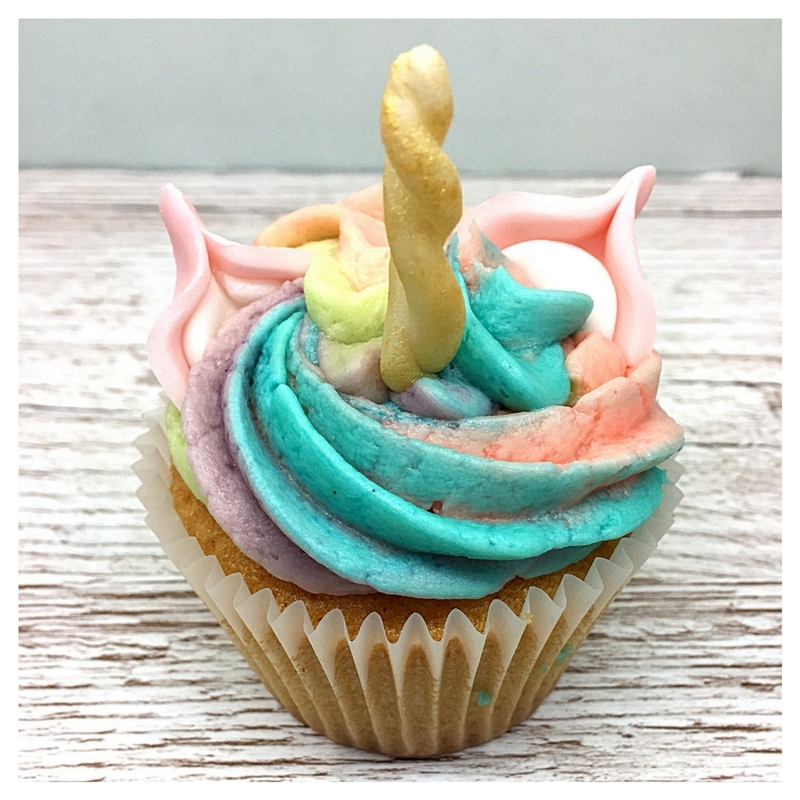 I used a star nozzle and swirled the icing on top. I decided to make my horns gold. 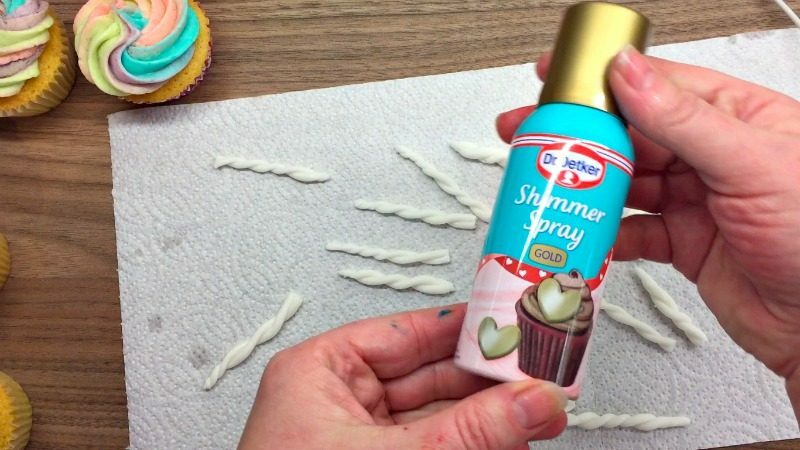 As I wanted to use them straight away, I should have used an edible gold shimmer dust as this spray made them slightly wet and tacky and softened them. 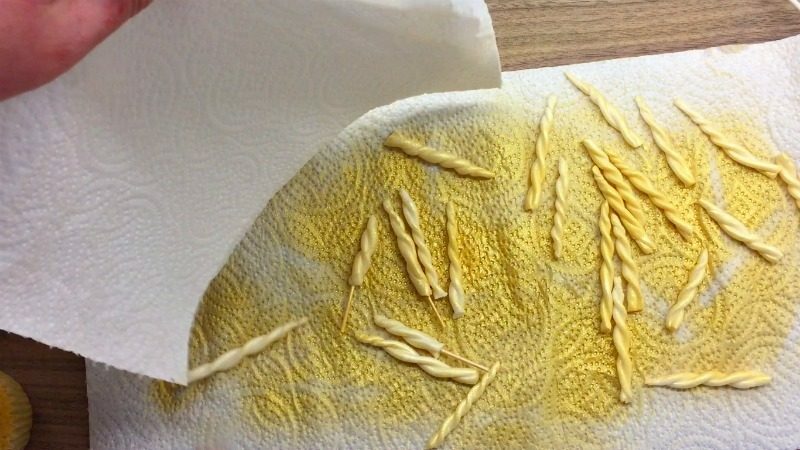 They did harden up again but I would do this a few hours before I needed to use them if I were to use this spray again. 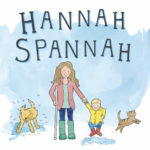 Now there is nothing else left to do other than to decorate and add the finishing touches. Tadaa! 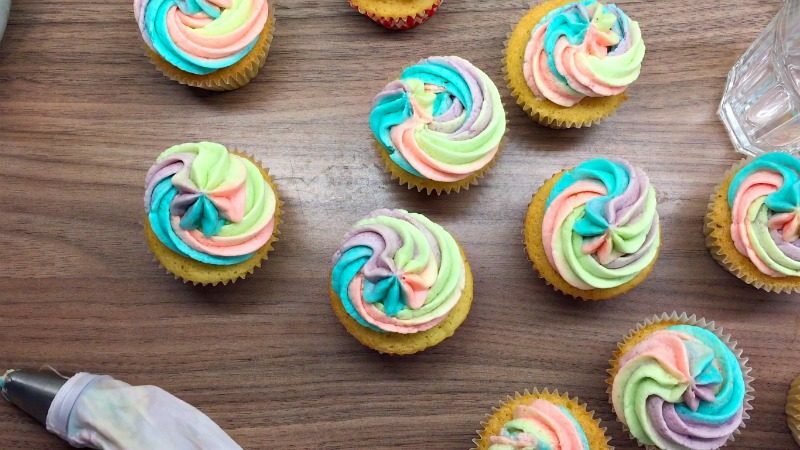 You now have Rainbow Unicorn Cupcakes. I made a video tutorial to accompany this post if you would like to take a look.